a 56-year-old Pittsford, Mich. man was driving his 1999 Chevy S-10 pickup truck northbound on S. Bird Lake Road south of Tamarack Road when the child walked across the road at the crest of a hill. The 56-year old man stated he tried to swerve to miss the child then began to start braking. The driver struck the child, and came to a rest down the road. He then got out of his vehicle to help assist the injured child, according to the release. The child was pronounced dead at the scene by Hudson EMS. The accident remains under investigation. Another report describes the child as a one-and-a-half-year-old. There are few details other than that. As in the recent stories of an Amish 6-year-old killed chasing a windblown hat, or another boy struck and killed while sledding, Amish children are at special risk of traffic accidents. Compared to non-Amish children, their risk is elevated due to a number of cultural factors. And while the buggy SMV triangle issue gets a lot of attention, should the safety of Amish children on and around the road be of even greater concern? Lots of children – Amish have large families, with 6-8 or more children typical. More often on the road – Compared to non-Amish children, Amish kids are simply on the road more often. Why? Activities not seen much anymore in general society–walking to rural schools and a highly outdoor-oriented lifestyle, meaning more outside than inside play. Age – Sometimes these are quite young children. They are taught about road dangers. But they’re still very young in many cases, as in this Michigan accident. Older watching the younger – As tends to be the case in large families, older children watch the younger. While they’re taught well, they’re still children and can have lapses of attention. Different approaches in different communities – Is physical safety emphasized more in some Amish communities than in others? Use of safety clothing suggests so. On this point–to state the obvious–Amish parents are certainly concerned over the safety of their children. Any casual visitor will pick up signs of this: “Slow-Children At Play” warnings posted on lanes (especially if a business is located at the home), or children wearing bright safety gear while walking to school. In some cases Amish children ride buses, or parents pay drivers to take them to school. But as we’ve seen so often, the Amish have diverse approaches to many things, including safety. Safety gear acceptable in one church may not be in another (assuming, of course, that safety clothing makes a significant difference). What can non-Amish people do? Some Amish take the stance that it is God’s will that accidents happen. Other Amish seem to incorporate that idea, while taking more material steps to preserve safety. English people also have a role to play. We often like to think we can control everything. God knows we’ll never prevent every accident. But keeping in mind that the above factors are in play–and keeping a watchful eye when driving in Amish communities–may help prevent some of them. What do you think? What other ideas to keep in mind? What else can help improve safety for Amish children? What a tragedy and so very sad. A reminder to us all to practice extra caution and defensive driving whenever we are in Amish areas, or any area that children are. My prayers and condolences to the family of this horrible accident. My heart to all involved . (((Prayers)) to all who loved and cared for this child. I remember seeing a family of (probably) Mennonites walking in a long line of people from point A to point B, on a country road, they where more than likely safe there, but it was interesting to see such a big family, at that moment they where all ‘under control’. I also can’t help but wonder how many times Amish people in buggies have hit and injured children… that sounds cruel in the topic of this post, which is very sad (the topic), but it could warrant investigating. My instinctive reaction to the issue of buggy fatalities would be that speed plays such a big part in the ability of a driver to execute a sudden stop, that I would have thought buggies would be safer than cars as regards their likelihood to run people over (and as to the seriousness of injury in the event of an accident). Having said this, they are arguably less safe for the occupants in the event of a car/buggy collision. My question is the same as it would be in the case of an accident like this happening in a non-Amish family; where were the parents and why was this child not being properly supervised? Those were my thoughts also. Although my heart aches for this family’s loss, I cannot imagine a one year old child being in the road anywhere. This child should have been indoors with its mother. I too lost a child, a 21 year old daughter, to a car crash. It’s the worst nightmare for any mother or father. Even though I know she’s in a better place and we will be together again one day, I still grieve and mourn the loss of her companionship and sharing of her life. From the description of the location of where this happened, it sounds as though the driver of the vehicle simply could not see the baby until he crested the hill, at which point, it was just too late. Not only will the parents feel the loss of this child, that gentleman driver will never get over this either. Can you imagine the horror of finding you have killed a baby???? I can think of nothing worse than losing your child. Prayers for these poor people who are all involved. My thoughts and prayers are with this family as they go through this very tragic time in their lives. Why can’t the government build a separate bike lane? I have visited other countries where there are highly used bike lanes and no one gets into accidents because drivers are aware of pedestrians and cyclists at all times. We just need a change in the way we approach the road. Maybe we can start by having lanes in major roads in Lancaster, for example and get the English more educated on the manner. Of course, it wouldn’t change accidents for everyone but I would imagine it can help. I wish more English would use bicycles so that more people bike and less people drive. It’s just good for everyone for so many reasons. So sad about this little baby. To the Amish, that child is in a better place. And that child does not have the worries and troubles in this life that we have. It is sad and terrible and makes one heart sick, and the Amish do feel that way too. But, as Erik pointed out, it is seen as God’s will. He is not to be questioned as to how or why. That vehicle driver is probably in a worse situation than the Amish as that man does not have the support community that the Amish have. Our culture is just not like that. Now, as the family and friends gather for this child’s funeral, two things that will be said many, many times are “We never know when it is our time to go” and “Are you ready today?”. Think about those two concepts. You DO NOT know that you will live through today or tomorrow, so ARE YOU ready to meet God today? This is the big paradox. We love them and want them with us and so deeply feel the pain of loss, but believe/hope that when they die the place they end up is better than we can even conceive–it’s where we ultimately want them to be. It’s hard not to struggle with that on some level. Thoughts & prayers are with the family. Leila , here in Holmes many of our major roads have buggy lanes. I wish more did. I am so sorry for the loss to the family and the community. It is not for us to judge why this happened. Only God knows and rest assured that precious Amish child is with God as we speak. Accidents happen and are not always someone’s “fault”. The most we can do is pray for the family and the child. Oh no! When people are driving, they need to be more careful. Especially in an Amish community. At least the man had the decency to help the injured toddler. That is just awful that the child died. The family will be in my prayers. I can’t even imagine how they are feeling right now. That is just awful. No one knows when he will meet the lord, but the loss of a child is especially tragic. My thoughts and prayers are with the community for their comfort and peace. A tragedy. I can’t imagine how I’d feel, though the Amish have grief counselors all around them–their extended families & friends. Their belief of the child being in a better place is much more deeply held, it seems, than us English. Still, they will need the blessing of time to get through the sorrow. How common (statistically speaking) is such a tragedy in Amish communities? A good question Alice Mary, and I don’t know the answer. There have been buggy accident studies, but I’m not sure if there has been anything strictly concerning Amish pedestrians. If I find something I’ll circle back here and let you know. After a grocery-list of things that have for weeks kept me busy and limited on my ability to interact with AA here, it’s sad that my first article as I play catch-up has to be about such a tragedy. So very, very sad. I think, Erik, your points on why there appears to be more of such accidents among the Amish (vs. the English) is insightful. I would wonder if media ‘hype’ and the felt novelty of the Amish would steer the media towards an Amish story over a similar English story in their routine news-selection process. Any child hurt in a accident has the media-coveted emotional-knee-jerk reaction by the readers/watchers, but adding the “Amish” element to it just arguably makes for an even greater response and thus a greater tendency to be reported. I would never assume that cases reported (Amish vs. English) by media were necessarily reflective of real per-capita data. I find the consideration of handling of loss by the Amish vs. by the English an interesting thought to ponder. I have no doubt that some level of an unquestioning “all things are from the hand of God” mentality among the Amish is a part of the explanation. However, I have to wonder if the English “helicopter parenting” mentality (coined/popularized after the World Trade Center disaster of 9-11, referring to the increased tendency for parents to “hover” over their kids in an overly-protective manner) may also have an impact on the “norm” or “standard” by which we evaluate the Amish response. Don’t get me wrong, I’m all for being protective against all *reasonable* dangers that our kids might get into. But the near-paranoia that many parents nowadays have – plus the fact that many parents do not share the Amish’s assurance of being with the child in the hereafter – would seem to be a huge part of the explanation of the difference. In short, the calmness and acceptance by the Amish as they are compared to today’s “norm” may speak more about the erosion of the norm than it does the stance of the Amish. Great comment Don. A number of good points. Hard data on Amish child pedestrian accidents would be handy to have, because as we’ve seen the Amish element in a story is motive in and of itself to report it and for other outlets to pick it up and spread it. I do think the features of Amish culture listed above make their situation different from the majority of North American children with its own specific risk factors, and I think it’s safe to say their risk is elevated just because non-Amish are infrequently if ever in the same situations (walking on busy roads to school, riding pony carts, being watched by siblings only a few years older). Non-Amish may have greater risk levels in other areas (as passengers in cars, ATV accidents, etc). I don’t think I’d be comfortable letting my theoretical children have as much range as it seems some Amish kids have, but I also wouldn’t want them wearing helmets and kneepads on the playground. 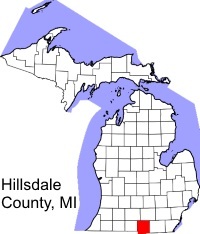 A week before the child was killed in Hillsdale, a boy was killed in the nearby Amish community of Homer, MI. He was riding in a cart being pulled by his father’s buggy. They were returning from a trip to the feed mill when the cart disconnected from the buggy. The tongue of the cart dropped to the road, stopping the cart instantly. The ton of feed sacks toppled onto the boy killing him immediately. The child from the above story in Hillsdale was a girl, almost 2 years old. The mother had lead her 4 children to the mailbox, but only the mother crossed the road to get the mail. The mother then walked back to the house assuming all 4 children were following her. No one knows why the little girl did not follow. The pickup driver almost cleared her during his swerve, hitting her in the head with the last foot of his bumper on the right. She also died immediately. As these deaths demonstrate, when it is your time to go, you will go, ARE YOU READY TODAY? 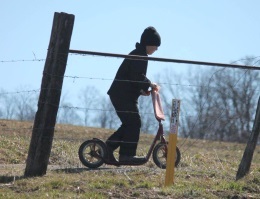 We’ve noticed several Amish children and also grown women wearing bright orange/yellow reflective safety vests as they walk or ride scooters along our rural roads. Haven’t seen any men wearing them, but it’s usually children walking home from school or women traveling on foot. The men are usually in the fields or in the buggies, not out walking the roads, I guess! I don’t have data but my guess is they are becoming more common. At least over the time I have followed the Amish, around 11 years now, it seems you see more of them. What area are you in if I can ask? Erik, I’m in southern York County, PA, just across the Susquehanna River from Lancaster County. I’m the one who sent you pictures last year from the Airville Fire Company Mud Sale. Our area has a rapidly growing Amish community. There is an Amish school on our road less than 1/2 mile away and many local farms are being bought by Amish families. In fact, the farmland surrounding our house may someday be bought by the family down the road – they have already approached the owner about buying it when he’s ready to sell. Of course, thanks Rita–I do remember those photos. I assume those are mostly families out of the main Lancaster settlement. I’d guess the land is at least somewhat more affordable than the sky-high acreage in Lancaster County. Also, Erik, we don’t have Rt 30 with the traffic, crowds of tourists and “touristy” attractions. No tourists here at all, unless they’re driving down Rt 74. to get to Lancaster. I would think that might have something to do with their decision to settle here. Mark asked me to post this so that folks could pray. An elderly Amish couple, part of the Guthrie, Kentucky settlemnt were murdered in their beds late Saturday night/Sunday morning. Their home was entered. They were bound. The man, Amos Yoder was 79. He was bound and gagged and beaten to death. His wife was bound and beaten but survived. A load of the Guthrie youth were in Belle Center over the weekend and received the shocking news Sunday morning. Four of the youth were grandchildrenn of the couple. It was a terrible shock for everyone. Robbery is the suspected motive. Please pray for the family. Mark had the youth boys from his district about eight of them, plus the youth boys from Guthrie, another eight boys over to his house for a cookout, Friday evening. Thanks for sharing this Don. Just horrible to think about. Another of our readers emailed me some links about this recently, where they describe the family as “Mennonite” (but these are Amish as you know, just the progressive electric New Order community). I hope people will say a prayer for the family and community, and for the wife’s recovery. Assuming this was a random attack, it must be especially frightening for the community.